Sadly and perhaps selfishly, I feel a great personal loss with the passing of Eddy Arnold. He was the last of the country music icons who touched my life early and often. In recent weeks I'd been in frequent communication with Eddy's family, hoping for a chance to visit with him again, but time ran out before that could happen. As a young boy, the very first record I ever purchased with my own meager savings was "There's Been A Change In Me"... one of Eddy's #1 hits in the early 1950s. I once told Eddy the story of how -- just one day after I bought that old 78 rpm RCA record -- I sat on it, and shattered it. It's funny, but all these years later I still clearly recall the color of the chair in which the "sitting and shattering" took place.... and the exact spot in our living room where the chair was located. That's the way it is with memorable events... every detail is locked in your brain. When I related that story to Eddy a few years ago, he told me he could get me another copy of that song, and he wasn't sure it would be on a 78 rpm record. In the 1950s, when I got the news that Eddy Arnold would be performing in my hometown, I quickly went into my savings again and bought a ticket. I was first in line there at the Imperial Theatre in Augusta, waiting for the doors to open... and when they did, I grabbed a seat on the front row, just a few feet from where Eddy performed. Years later, the first time I interviewed Eddy, I jokingly asked him if he remembered seeing me in the audience... "Ah yes" he answered, "I remember you... the little boy in the short pants." Just a few months ago, I was invited to an event there in Augusta at the old Imperial Theatre, and I got the chance to stand on that stage in the exact spot where Eddy had performed a half century earlier.... and I told the audience that story.... even pointing out the exact seat where I had been sitting. Wow.... that's another chair that I vividly recall..... because of Eddy Arnold. 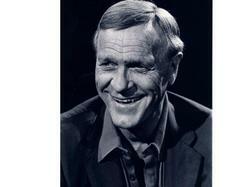 Eddy Arnold was the most successful singer ever to come out of Tennessee. He sold 85 million records -- and kept selling records during, what were, tough times for many other country performers. Part of his secret was an ability to adapt. Without changing himself as a singer, he could adjust the orchestration that surrounded him, and stay on the cutting edge. But the biggest part of his musical appeal simply cannot be explained. It was his voice. At its center, a mysterious little kernel.... a nugget.... that made him stand apart. Someone once described his voice as something akin to the lower register of a clarinet. Add to that, he was a dignified gentleman. When historians talk about who put Nashville and country music on the map, Eddy Arnold will always be part of the conversation.